Dewsbury is to be the latest outpost of Eurocell Building Products - operator of the fastest growing network of building product outlets in the UK. The new branch makes more than 4,000 building products immediately available to DIY and trade customers working in the area and is the eighth branch to be opened in West Yorkshire. “We believe that we need to be near our customers to serve them, which is why we have such an extensive network of branches,” explains Fred Sammut, Regional Manager. “This is a very mobile industry in which a customer could be working anywhere in the West Yorkshire region from one week to the next. Handily located on the Mill Street West Industrial Estate, the Dewsbury branch is only quarter of a mile from the town centre and just off the main ring road (A638). The branch is less than five miles from the motorway network, being easy to reach from either J40 of the M1 or J28 of the M62. Ideally placed to serve the surrounding towns of Batley, Heckmondwike, Mirfield and Cleckheaton, the new branch completes the regional network comprising Barnsley, Leeds, Huddersfield and Wakefield. 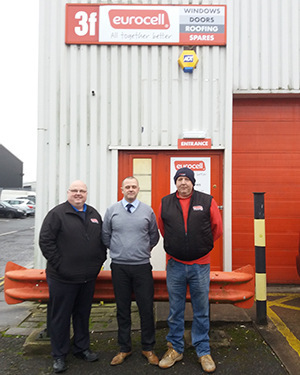 The Dewsbury branch is the latest addition to a network of 190 throughout the UK, which all share the same hallmarks of customer service – easy access and plenty of space to park and load. Another bonus is that it is right next to associated merchants, such as City Plumbing Supplies, so customers do not need to make a special trip to pick up essential tools and materials. All Eurocell branches are identical, so that customers can easily find what they need. So, the Dewsbury branch is equipped with a showroom and a large trade counter area that stocks products including Skypod skylights, Equinox tiled conservatory roofs, roofline products, rainwater systems, window finishing trims, doors and conservatories. Customers can also purchase underground drainage, hand tools, power tools and protective clothing. Many of these products are manufactured by Eurocell, so customers gain all the benefits of buying direct, with no middleman.